Many home stoves can’t generate the blazing heat found in restaurant kitchens or even Chinese/Eastern households standard kitchen stoves. Many British homeowners, for example, like to use ceramic or electric gas jobs. While a blazing hob is best, to get the best results when stir-frying meat, you need to adjust your techniques a bit. Marinate the meat. A good marinade helps tenderize the meat and add flavor while using cornstarch in the marinade seals in the meat juices. Let the meat sit at room temperature in the marinade for about 15 minutes while you prepare the other ingredients. Remove the meat from the marinade with a slotted spoon. Discard the excess marinade. You can add a little bit of bicarbonate soda to the meat when you marinate it. Bicarbonate soda can also help to tenderize the meat. Be sure to preheat the wok before adding the oil. Add oil to the wok, tipping the pan to swirl the oil around. 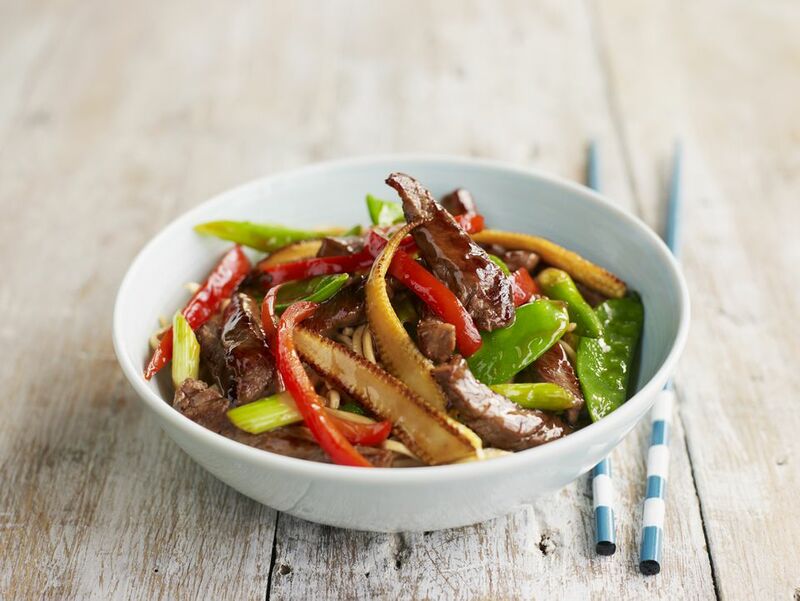 Since most Western household’s stoves are not powerful enough to cook stir-fry dishes, use a skillet or frying pan to prepare stir-fry beef for this kind of dish. The bottom surface of skillets and frying pans are bigger so the liquid can quickly reduce to nearly dry and the cooking time will reduce as well. Never put too much food in a wok, don’t crowd the food. Lay the pieces of meat out flat in the wok, taking care not to overcrowd. Instead of immediately stir-frying, let the meat sear for about 30 to 45 seconds, before starting to stir-fry. Then, stir-fry the meat for a couple minutes until it changes color, splashing with a small amount of rice wine or dry sherry if desired. Remove the meat from the pan to keep it from overcooking and drain. Add the beef back into the pan as called for in the recipe.